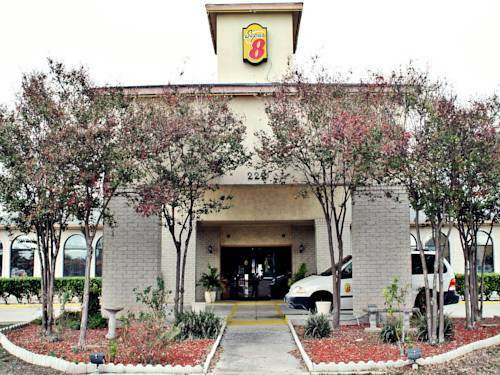 The Super 8 is the perfect location for the San Antonio visitor. We are a pet-friendly hotel, conveniently located off Interstate 10, minutes from attractions like Splashtown San Antonio water park, the Alamo, the world-famous San Antonio River Walk, the Alamodome arena, the San Antonio Zoo and Aquarium, and SeaWorld San Antonio. We are only one exit away from The AT and T Center, the home of the Spurs. Six Flags Fiesta Texas amusement park, Fort Sam Houston and the AT and T Center, offering events, concerts and sporting events, are also minutes away. The hotel is only five miles from the Henry B. Gonzalez Convention Center. We offer full-service amenities like the Free SuperStart Continental Breakfast, Free Local calls, Free Weekday Newspaper and a Seasonal Outdoor Pool. Pets Allowed at Property 10USD per pet per night and Rollaways 10USD per night.